Through the natural beauty of Austria’s Wachau Valley, past quaint towns and villages-and stops in charming towns and cities of Slovakia and Austria along the way-you’ll fall in love with this river cruise along the Danube River. Board your ship in Budapest, Hungary, and relax with a glass of wine atop the Sky Deck as you make your way upriver. Glide through the middle of two countries for a 58-mile stretch as the border between Hungary and Slovakia is in the center of the Danube River. 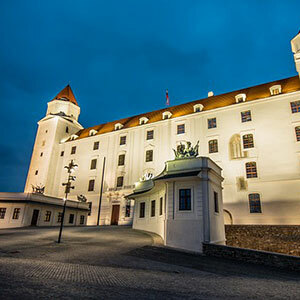 You’ll come to Bratislava, the capital of Slovakia. This dynamic city lies at the foothills of the Carpathian Mountains. Visit the gothic St. Martin’s Cathedral, the coronation church for Hungary during the 16th to 19th centuries. If you’d like, you can even visit its underground crypt with the catacombs of significant historical figures. In Dürnstein, a town situated among terraced vineyards, hike up to the ruins of Dürnstein Castle with your Avalon Adventure Host. And in Melk, you will visit Austria’s majestic Benedictine Abbey, one of Europe’s largest monasteries, where Benedictine monks still stroll amidst the sacred walls. Sitting high on a bluff, it offers the most breathtaking views of the city, the Danube River, and the Austrian countryside all at once.